This post contains affiliate links. You can view my full disclosure policy here. I am all about saving money when I go shopping. However, I am not a fan of traditional coupon clipping and ad shopping. I just don’t have the time to be that detailed about my shopping. I try to minimize my consumer spending as much as I can. I menu plan and stick to a list and loose budget when I shop, but I rely on a couple of handy apps to save money when I go shopping. 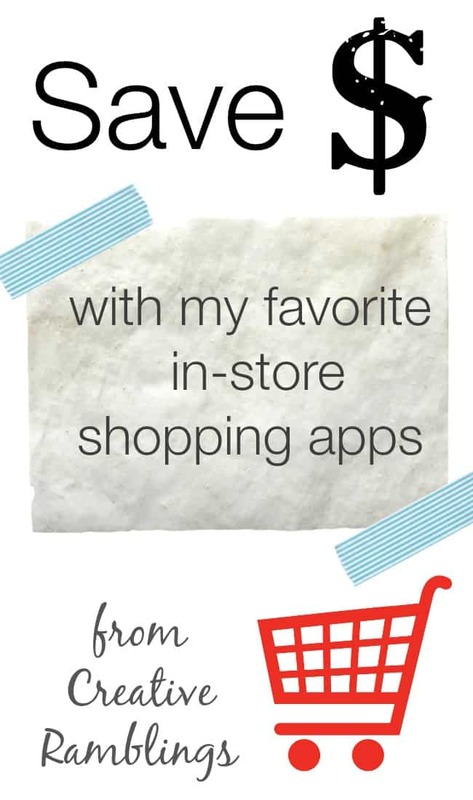 Let me share with you how I save money with in-store shopping apps. I used to get the Sunday paper. I would page through ads and clip coupons while compiling a shopping list for the week. I usually did this on a quiet Sunday morning before work. I would try to shop on double coupon day that week and would save a good amount of money. Fast forward a couple of years. I have 2 kids and no longer opt to get the paper. I just don’t have time to read it and hate all that waste. I also do not have the time (or maybe the patience) to pour over online coupons and print them. I still want to save on my shopping trips but have found more convenient ways. I am sharing with you the 2 apps that I use most often to save money on my weekly shopping trips. Cartwheel by Target and Wal-Mart. I will break down their functions and what I love most about them. I am also going to share with you a couple other ways to save money with in-store shopping apps and just touch on my 2 favorite online savings apps. How it works: This app (available for all major smart phone platforms) has a long list of offers in every store category. They range from 5% off a product up to 25% or more. When you start you have a set amount of offers you can redeem at one time. The more you use the app the more offer slots open up. 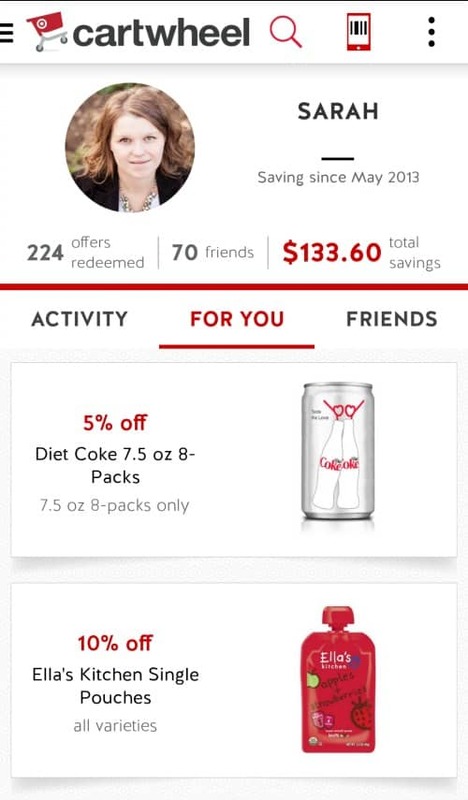 Load offers to your cartwheel and scan it at the register to redeem your savings. Offers: There are a couple of ways to find offers. You can plan at home by checking offers on your app against your list. Or you can do what I do. In the menu select “Scan Product”. I scan a product I want to buy in the store and Cartwheel will show me if there is an offer for it. This helps in deciding which brand of a product I want to buy. It also saves prep time at home. You can combine Cartwheel offers with register printed coupons and manufacturers coupons. If you do take time to plan these savings can really add up. The Wal-Mart app is pretty straightforward. It allows you to shop online and check prices among with things. There is one additional option that I love! 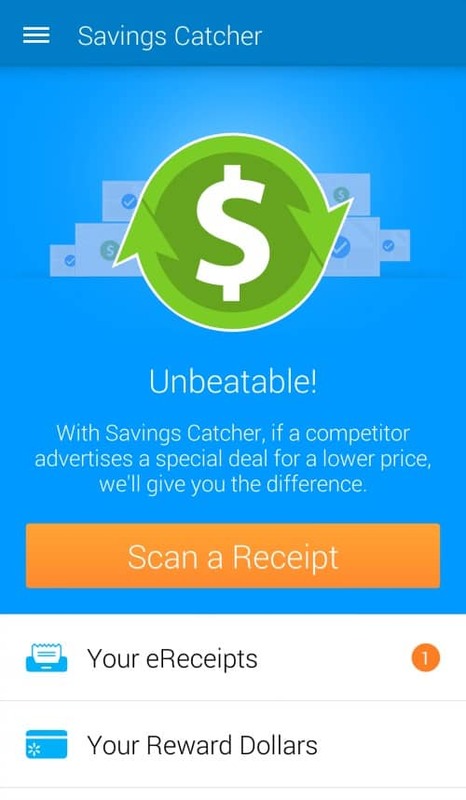 Savings Catcher: Scan your Wal-Mart receipt and if a competitor advertises a deal for a lower price you get the difference. The difference comes in an e-gift card you can use in-store or online. So easy! A couple other apps I like for in-store shopping. Amazon – What can’t Amazon do. They have a scan function on their app that allows you to scan a product wherever you are shopping and compare the in-store price to the Amazon price. I have Prime so most of the time shipping is not an issue. I have saved a decent amount this way. Card Star – this handy little app takes all your rewards and membership cards and puts them on one simple app. So much easier than lugging everything in your wallet or forgetting the rewards card and not getting that deal you were planning on. Coupon Sherpa – hundreds of retailer coupons right on your phone. Shopkick – this app shows products and deals near you and rewards you just for walking into many stores, among other cool things. This could be another post entirely but I want to mention just 2 online apps I love. RetailMeNot – This site is a treasure trove of discount codes. It does offer some in-store options but mostly online. I check it every time I buy something online. That’s my strategy to save big on shopping. Not that complicated. It’s great to save money, but the real key is not spending it in the first place. My ultimate goal, a big work in progress, is widdling down consumer spending to only that which my family and I really need. How do you save money when you shop? What is your favorite app? This is for splurge items but my name-brand crazy pre-teen just informed me that PINK has an app. It gives the user invites to special not open to the public sales and coupons for free items. We haven’t tried it yet, but I guess we are going to a secret sale soon. I will also say that I like cartwheel and generally just scan my products as I put them in the cart. On another money saving topic – as I said I have a name-brand kid – I signed up for the Gap credit card and American Eagle credit card. They are both major credit cards. I use them for gas and grocery or whatever and earn gift certificates for both stores. Gap informed me that I saved over $600 last year between sale items and the gift cards. I did most back to school shopping and some Christmas shopping with these gift cards. And I’m not cutting coupons!! I love Cartwheel, but I’ve never used the scan function before. I’m trying that next time! On my last Target trip I saved $47 with coupons and Cartwheel!